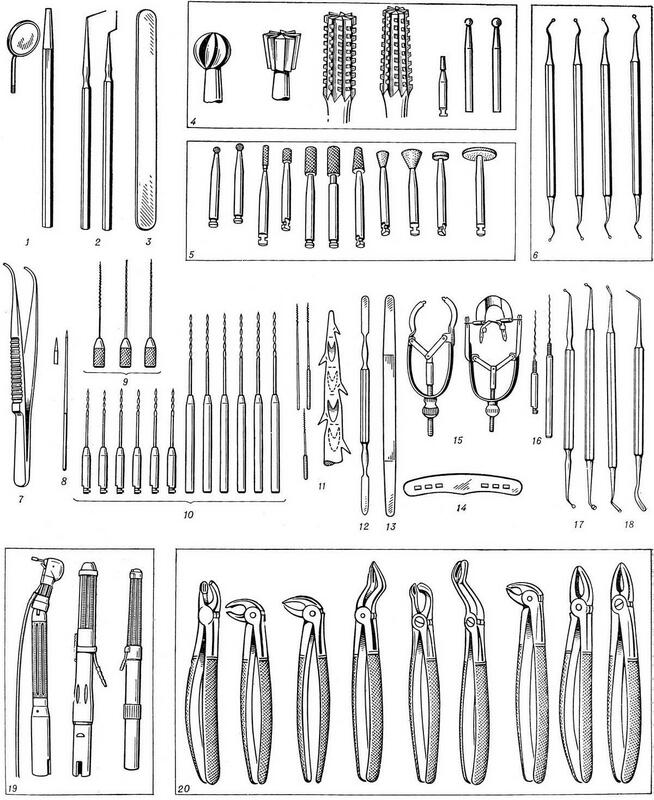 Dental tools - a set of special tools, used in dental practice. Tools for investigation of the oral cavity. A dental mirror (Fig. 1), with which produce the examination of the teeth and the mucous membranes or cover the operating field; they are also used to move the tongue and cheeks during the examination of the oral cavity; handle mirrors sterilized by boiling, mirror treated with antiseptic solutions. Probes dental (Fig. 2) to study prevalence of teeth caries, determine the mouth of the root canal, depth of periodontal pockets; they also contribute to the cavity of the tooth or gum pocket of medicinal substance. Spatula dental metal (Fig. 3) for discharge of the cheeks, lips, tongue. Therapeutic dental instruments. For preparation of hard tooth tissues used dental burs (Fig. 4); the heads of them have a different configuration, and the shank to plug to straight or angled tip; in the processing of tissues of a tooth a drill speed boron up to 10,000 rpm used steel forests; the tooth enamel these forests should be treated at lower speeds. For operation at higher speeds (up to 30 000 rpm and for turbine drills use forests with head carbide (tungsten and cobalt) or forests with head with diamond coating (Fig. 5). Excavators (Fig. 6) extract from the cavity of the tooth food remnants and soft layers of dentin, removes dental plaque; the working part of excavators is a flat and a Cup with pointed edges, connected with handle curved necks; produce excavators in four sizes. Drug treatment of tooth cavity is made with the help of dental forceps (Fig. 7); the tight of his lips curved at an obtuse angle to the branches, that allows to manipulate in cavities located in the distal part of the tooth; the pincer grasp cotton balls, rollers, tampons. Root needle (Fig. 8) in the form of round or cut thin metal rod is used to determine the direction of the root canal and make medicinal substances on cotton pitelka wound on the needle. In the treatment of periodontitis and pulpitis is widely used instruments for expansion and root canal treatment. Tilbury manual (Fig. 9) and machine (Fig. 10) apply for the extension of channels root. Dalibor is a tetrahedral pyramid rod twisted in length, so cutting sides have the form of a spiral. Pulpectomies (Fig. 11) - a thin metal rod on the working part of which there are thorns, are located in "Christmas tree", is intended for removal of the pulp from the root canal (enter its rotational movements of the fingers). For filling teeth cement or amalgam use special tool sets. There are sets of 9 instruments for the preparation of the tooth cavity and modeling in filling tabs. Spatula (Fig. 12 and 13) for mixing cement seals and time of dressing is a tool with a facetted handle, the ends of which there are elongated flat spatula. The mixing of cement better to make a plastic spatula Matrix shapes (Fig. 14) provide for the temporary replacement of the wall of the tooth filling. For fixation of the matrix and the tight wrapping her tooth apply the die different types (Fig. 15). For filling of root canals with liquid cement apply kangalanatolian (Fig. 16)that operates from a drill. They represent a wire spiral, is fixed in the cylindrical shank. Stopper (Fig. 17) apply to seal seal; the working part of their pear shaped, on the end - flat or slightly concave surface that prevents the filling material extrusion. Ironing Board (Fig. 18) is intended for formation of seals, their smoothing and remove excess filling material. Nozzles for drills (Fig. 19) are intended for fixing of dental burs and abrasive tools (diamond, corundum etc.) and transfer of rotation from the drill. Fig. 1. A dental mirror. Fig. 2. Probes dental. Fig. 3. Spatula dental metal. Fig. 4. Dental burs. Fig. 5. Dental burs with diamond coating. Fig. 6. Excavators. Fig. 7. The dental forceps. Fig. 8. Needle root. Fig. 9. Tilbury manual. Fig. 10 Tilbury machine. Fig. 11. Pulpectomy (right - increased 10 times). Fig. 12. A metal spatula for cement. Fig. 13. A plastic spatula for: cement. Fig. 14. Matrix shapes. Fig. 15. Mitripater.html. Fig. 16. Kangalanatolian. Fig. 17. Stopper. Fig. 18. Trowel. Fig. 19. Nozzles for drills. Fig. 20. Tongs for the removal of teeth.